Coconut Milk Rice Pudding with Fresh Mango – I Don’t Like Rice Pudding, But I Love This! I’m not a big fan of rice pudding, but curiosity got the best of me, and I needed to find out how much better/different a version would be that used Arborio rice, and the same basic technique as a savory risotto. In addition to trying out a new cooking method, I also wanted to sneak in some coconut milk for a little tropical twist, and I’m happy to report great success on both fronts. The Arborio produced a wonderfully creamy texture, and unlike tradition long-grain rice pudding, the grains of rice maintained a certain textural integrity, instead of just disappearing into one big, starchy mass. The coconut milk gave the pudding another layer of subtle sweetness, and also inspired the fresh mango garnish, which really elevated these bowls of comforting goodness. Of course the mango is optional, and you’re welcome to take your chances with raisins, preferably golden ones. If desired, those can be added at the same time as the sugar and salt. Speaking of bowls, I generally don’t make dessert for three (except this one time, at band camp…), but I had some new porcelain ones I wanted to use, and didn’t bother to check the volume before ladling in the sweet porridge. Despite my “odd” yield, you should get four nicely sized portions from the amounts below. And yes, if you can’t find coconut milk (which you can), simply use all milk. I hope you give this coconut milk rice pudding a try soon. Enjoy! As I mentioned in the intro, this orange zest beef recipe is not supposed to be Chinese food, or even Americanized Chinese take-out food. Of course, since it’s obviously inspired by those day-glow orange, deep-fried beef nuggets (which may or may not be actual beef), comparisons are inevitable. While I have no delusions that those crunchy bits would be preferable to most people, especially ones that just stumbled out of a Phish concert, this much-lower-fat alternative is still a quick, easy and perfectly delicious meal. You’ll want to use a tender beef for this, since the cooking time is only 4-5 minutes. Cheaper cuts like chuck are going to be too tough, unless, of course, you pound it paper-thin, or use some kind of tenderizer. I used sirloin, which worked fine, but ideally you’ll find yourself some beef tenderloin trimmings. Here’s another instance where you are much better off going to talk to a butcher, rather than a clerk at the supermarket. A real butcher will sell you the scraps produced when a whole tenderloin is trimmed. The meat is cut from something called the “chain” (be sure to use that word to impress the butcher), which is super-tender, and probably half the price. One last tip: Be sure the beef is VERY well drained before it hits the hot pan. If your meat is wet, it will just boil and steam, and won’t work as well. Of course, if beef isn’t your thing, this will also work with chicken, pork, and…[gulp]…textured vegetable protein. I hope you give this a try soon. Enjoy! I would have gotten more search engine juice had I named this, “Hot Fudge Sauce,” but it wouldn’t have been technically correct, and you know what a stickler I am for using precise terminology (if you’re new to the blog, that was an attempt at self-effacing humor). So, while it’s true I generally play fast and loose with recipe titles, when they really do mean different things, I try to come correct. What makes this a chocolate sauce, and not hot fudge, is the fact that it doesn’t firm up when it hits the ice cream. True hot fudge sauce is actually melted, liquefied fudge, and by the time it finishes its slow slalom down the side of your sundae, it will resemble its namesake. Hot fudge requires the sauce to be cooked to a specific temperature, for a certain time, and is generally a trickier operation than the simple sauce you see here. Like I said in the video, I’m sure we will eventually do a hot fudge video, but in the meantime, this ultra easy chocolate sauce should work fine. Unlike hot fudge, chocolate sauce (aka chocolate syrup) will stay in liquid form even after it hits the cold, creamy stuff. Of course it gets a bit thicker as it cools, but it will not harden into actual fudge. If you are looking for comparisons, this may remind you of a thicker version of a certain canned chocolate syrup from Pennsylvania. Anyway, if you are a regular buyer of store-bought chocolate sauce, and didn’t realize how easy it is to make your own at home, then I hope you give this recipe a try. Enjoy! This incredibly delicious bacon and crab bread pudding Benedict almost never happened. The original request was for crab cake eggs Benedict, but since we’d already done crab cakes, poached eggs, and hollandaise videos, I decided to go in another direction, while still somewhat honoring the aforementioned food wish. It’s one of the best decisions I’ve ever made, and that includes growing the mustache. Not only do I think this is far superior to crab cake eggs Benedict, it’s way easier, and you get a lot more mileage out of the same amount of crab. I only used four-ounces of crab, which would have made just two small crab cakes. Here it was enough for two large ramekins that seemed to be loaded with crab. Instead of just sitting on top of the English muffin, the crab flavor permeated the bread cubes during the baking time, and the results were spectacular. This would certainly make any brunch special, especially a Mother’s Day brunch, which will be here before you know it. So, whether you’re desperately trying to finally gain your mother’s approval, or just want something awesome for breakfast, I hope you give this a try soon. Enjoy! The next time you see this, it'll have poached eggs and hollandaise on it, and be in a video. Stay tuned! Harissa is probably my all-time favorite hot sauce, and one I’m sure you’ve seen me use in a bunch of recipes here. As I mention in the video, a small spoonful of this makes virtually any savory dish better. As with any similar recipe, there are countless variations using many different combinations of fresh, roasted, boiled, and dried chili peppers. Same goes for the spice, but I really like the blend listed below. Dried mint really has a unique, and much different flavor than the fresh herb, and as I hope you experience, toasting the caraway and coriander does wonderful things. I could do a 5000-word essay on what you can do with this sauce, but just for starters consider these ideas; Harissa aioli, pizza sauce, sandwich spread, steak sauce, chicken marinade, and rubbed on your knee to help that arthritis (warning: check with your family doctor before starting any sauce-based treatments). Anyway, if you’ve seen me use Harissa, and were frustrated that you didn’t have access to any of this magical product, now you can make your own. Enjoy! 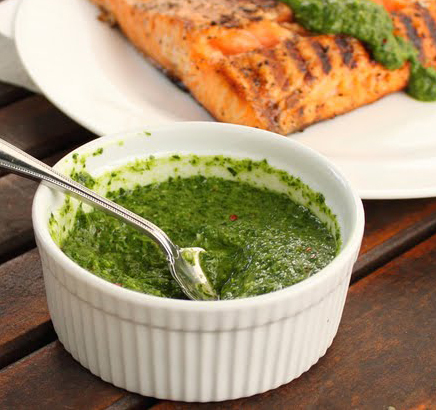 Besides being very green, this recipe is also perfect for a St. Paddy’s Day re-post because, as legend has it, an Irishman named Jimmy McCurry (who fought alongside Argentinean rebels in the early 1800's) is credited with introducing this sauce to the America’s. Thanks, McCurry, and a happy Saint Patrick's Day to you all! Enjoy! This broken spaghetti “risotto” is many things – a fun-to-make recipe; a visually unique pasta dish; and a great alternative to the same old starchy side dishes – but one thing it’s not, is a risotto. No rice was harmed in the making of this video. The “risotto” refers to the similar technique used for that famous Italian dish. Like the grains of Arborio rice, the pieces of broken pasta are tossed in hot butter or oil before the liquid is added, but here we’re going even further, and toasting it to a gorgeous nut-brown. This gives the dish its signature look, as well as adds a subtle nutty/toasty flavor. The rest of the process is similar to risotto as well, with the broth being added in increments, to be absorbed by the noodles before the next splash is added. The broth amounts below should be very close to what you’ll need, but as I said in the video, depending on the pan, heat, and size of batch, you’ll have to simply adjust on the fly. As long as you don’t walk away, you should be fine. Just keep stirring until the liquid is almost gone, then taste, and if the pasta is cooked, you’re done. If it needs more, add a little broth and keep going. I did this as a simple side dish, but if you added some vegetables and shredded chicken, you’d be looking at quite an impressive main course. In fact, don’t be surprised if you see this dish re-imagined here in the future. In the meantime, I hope you give this a try soon. Enjoy! On Thursday, February 21, 2008, we published a post called, “The End of Chicken Parmesan As You Know It,” offering an easy casserole version of this iconic Italian-American restaurant favorite. The title was hyperbolic, but inexplicably, the poorly lighted, lamely voiced, low-res video actually did go on to become the most popular chicken recipe video in the history of the Internet. Thanks to YouTube, and social media sites like Pinterest, this alternative to the much, much messier and time-consuming chicken Parmesan went viral, and literally millions of people have watched and made this dish. So, with all the massive traffic visiting that old post, I felt the need to upload a nice, new version in HD. Besides culinary vanity, I wanted to repost to address the concerns of a few that the cooking time wasn’t long enough. This recipe has generated more positive comments and emails than just about any recipe we’ve done. People LOVE this recipe, and seem to enjoying spreading the word with unbridled enthusiasm, so I found these occasional “doesn’t work” emails very mysterious. Anyway, I’m happy to report that just like in the original recipe, 350 degrees F. for 35 minutes, plus a 10 minute rest, was plenty long enough to cook my fairly large chicken breasts. So, why did some people have a problem? Breast size and temperature. I believe that most of the people that had issues were using just-thawed chicken that was still very, very cold inside. Of course, the optional quick sear in a pan as shown here will take care of that issue. Also, grocery store chicken breasts can range in size from 6-ounce up to 10-ounce, which obviously will have much different cooking times. So, the best thing to do is forget time, and simply use a thermometer. I like to pull at around 155 degrees F. internal temp, and after a little rest, they are perfect. I would start checking at the 30-minute mark, and be sure to test in the middle of the thickest part of the breast. Besides cooking time, the rest of the recipe is ridiculously easy, and really does provide a very high-quality chicken Parmesan experience. So, if you are one of the few people in the civilized world who has not given this recipe a try yet, I hope you like the new HD version, and give it a whirl soon. Enjoy! *by the way, the same amount of fake Parmesan will not taste the same, and the amount may need to be adjusted…go buy some real Parmigiano-Reggiano! Garlic Parmesan Dinner Rolls – Can Something Look Too Good? Let me start by saying that these garlic Parmesan dinner rolls were really great – crusty and cheesy on the outside, tender and garlicky inside, and visually gorgeous. Ironically, it’s that last adjective that may cause problems. These looks so inviting, so tasty, and so beautiful that it’s almost impossible not to be let down when you bite into one of these and realize it’s just a dinner roll. It’s a great dinner roll, a special dinner roll, but a dinner roll nonetheless. As I said in the video, when the towel is pulled back (we call that, “breadbasket burlesque” in the business), and these lovelies are finally revealed, your guest’s eyes will send messages to their stomachs to get ready for something way more awesome than a dinner roll. So, this becomes a classic case of having to manage expectations. You need to make sure your diners know this is a humble bread bun, not some mini calzone, or other stuffed wonder of modern baking. Anyway, it’s a great problem to have. So the next time you want something a little above and beyond the plain roll, I hope you give these a try. By the way, the leftover rolls make about the best salami sandwich, ever. Enjoy! NOTE: Don't add all the flour at once. Add some, and continue adding until your dough looks like mine. You may need more flour as you go for the board. I know I may have used a few atypical ingredients in this, but as far as I’m concerned, the only two things that are mandatory to make a “real” Shepherd’s Pie are potatoes and lamb. While the ground beef version is also very delicious, it’s not considered a “Shepherd’s Pie,” since shepherds raise sheep, not cows. The real mystery is why the beef version is called “Cottage Pie,” and not “Cowboy Pie,” or “Rancher’s Pie.” When I think about cattle, many things come to mind, but cottages aren’t one of them. Okay, now that we have all those search keywords inserted, we can moooo’ve on. By the way, I know it’s something of a Food Wishes tradition that I do a cheap, culturally insensitive joke about Irish-Americans drinking too much in our St. Patrick’s Day video, but this year I decided not to do any. In fairness, I know hundreds of Irish people, and several of them have no drinking problem whatsoever, so it just didn’t seem inappropriate. Anyway, as I say in the video, this would make a lovely alternative to the much more common corned beef and cabbage that you may have been planning for dinner. Also, I really hope you find some nice Irish cheddar. I used one called “Dubliner” by Kerrygold, which can be found in most large grocery stores. If you’re curious about beverage pairings, may I go out on a limb and suggest a nice Guinness, or other Irish beer…just hold the green food coloring, please. Erin go bragh, and as always, enjoy! There are few food folks I enjoy and respect more than Michael Ruhlman. He’s a celebrated, award-winning author; an influential and generous member of the food blogging community; and my favorite Iron Chef judge (best perplexed look in the biz). However, in this amusing “Had Something to Say” video, produced by friends Diane and Todd from White on Rice, Mr. Ruhlman reminded me why, when it comes to cooking at least, being right isn’t as important as being happy. Everything Michael says about the rounded wooden spoon’s design in this “Stupid Kitchen Tools” video is correct. 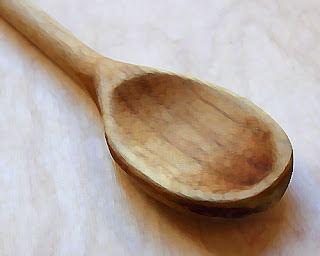 A squared-off, flat-edged wooden spoon is the superior stirring implement, but that doesn’t change the fact that my mother used a rounded wooden spoon, which was the same one that my grandmother used, which was exactly like the one that my great grandmother used. So for me, it looks right, feels good in my hand, and contrary to what Mr. Ruhlman believes, serves as the perfect tasting instrument – lovingly associated with all kinds of delicious memories. I’m sorry, but tasting spaghetti sauce off a square wooden spoon is like a chef using oven mitts instead of kitchen towels; it works, but it’s just not a great look. Squares and right angles are the work of man. It’s the shape of industry, not art. Nature is round, food is round, and people are, well, you know. Cooking equipment, like life itself, is much more about what you want, than about what you need. Our brains may grab for the square wooden spoon, but the soul of a cook reaches out for the rounded one every time. What say you? Sincere thanks to Michael Ruhlman, and to Todd & Diane for sharing this great video with us! You can follow this link to get more information and read their original post. Enjoy!